Athens is a must if you plan to visit Greece, especially for history lovers. It is a busy city with plenty of restaurants, businesses, and shops. Yet you will most likely find a historical attraction wherever you turn. My first stop was Acropolis Museum because it was already in the late afternoon when my family and I arrived at our hotel. Luckily there was a special orchestral event occurring at the museum so they were open til midnight. The following few days was when my family and I did all of our site-seeing at the top of the Parthenon, visit the square, saw of few more historical sites, and walked around the markets. I loved shopping at the markets because you can find everything there and it was where I did most of my souvenir shopping. If you are trying to figure out how long to stay in Athens, three days is sufficient enough to see most of the city. My family and I spent an extra day to do a bus day trip to Sounio, which is a few hours outside of Athens. The best way to get from place to place is by Metro because it is the cheapest way to travel. The only time I took a taxi was when I first arrived at the airport. → A historical city named after the goddess Athena. → Sunblock is a must during this time of the year. → Metro: Single train ride ticket is 1,40EUR to any of the stations. If arriving or departing from airport, a single ride ticket is 8,00EUR. Trains runs every day from 05:30AM - 00:00AM every 3 - 10 min depending on peak periods. 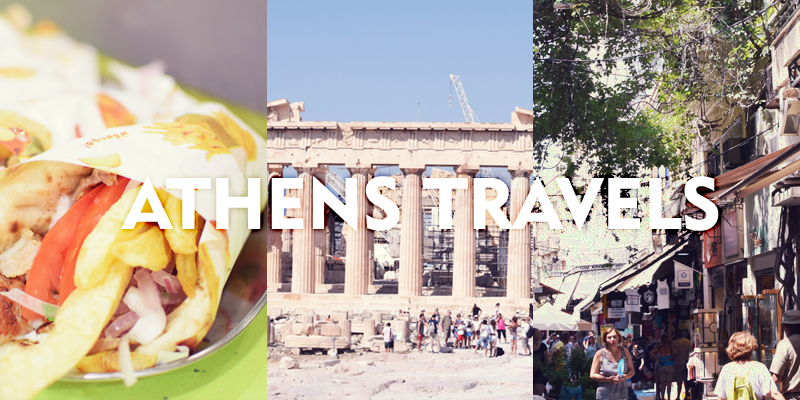 → To Acropolis Museum Boutique Hotel via Metro: Catch the Metro from the airport (take Egaleo Line) and get off at Syntagma Station to change lines (take Agios Dimitrios Line). Then hop off at Sygrou Fix Station. → Bus: Public bus transportation is 3,20EUR for a single ride. The bus operates 24 hours every 10-30 minutes depending on peak periods. → To Acropolis Museum Boutique Hotel via Bus: From the airport, you can catch the X95 bus were you will need to hop off at Syntagma Square. Then take either the Metro to Sygrou Fix or a taxi to the hotel (about a 3-5 min drive). → Taxi: Rates vary between day (6:00AM - 00:00AM) and night (00:00AM - 6:00AM) tariffs. → To Acropolis Museum Boutique Hotel via Taxi: Transfer from the airport to hotel can be arranged with the hotel for about 60EUR or by airport for 35EUR. → Try some Souvlaki (hamburger of Greece), Kalamari, Spinach and Cheese Pies, Keftedes (deep-fried meatball/chick peas). → Theatre of Dionysos: An open air theatre which honored the god Dionysos. → Parthenon: A temple dedicated to the goddess Athena within the Acropolis of Athens. If you want to go inside the Parthenon, there is a pathway for all tourist to follow. → Odeon of Herodes Atticus: A stone theatre within the Acropolis of Athens. → Areopagus (Mars Hill): A marble hill next to Acropolis. → Hadrian's Arch: A historical arch beside Temple of Olympian Zeus. → Dionysiou Areopagitou: A pathway on the southern slope across Hadrian's Arch. → Syntagma Square: Popular square attraction in the middle of the city and also a metro station. → Tomb of the Unknown Soldier: A monument that commemorates an unknown soldier and the many soldiers that have served in war. → Hellenic Parliament: The Greek Parliment near the Syntagma Square and where the Tomb of the Unknown Soldier lies. Streets: The streets are generally safe but watch out for pickpockets and beggars. Some are very clever at distraction your attention in order to steal your belongings, especially electronics. Tipping: Tipping is expected at hotels (1EURO/day), restaurants (5-10%), and taxis (5-10%). Plane ride to Athens, but made a stop in Vienna! Found a giant bottle of nutella filled with little bottles of nutella. Having a meal at the airport. Not coherent enough to know if it was breakfast, lunch, or dinner. Then some dessert. Still at the airport. Menu of the day at one of the restaurants. Enjoyed a delicious souvlaki the first night in Athens. The view at night of the streets by the Acropolis. Fresh peanuts being sold on the busy streets. The archeological remains at the Acropolis Museum. The full moon on the rooftop at the Acropolis Museum. You can step onto the stadium seats of the Theatre of Dionysus. I thought this was a cool picture of the aerial view from the top of the Acropolis. The Temple of Olympian Zeus from the Acropolis. After about an hour of making our way to the top, my family and I finally saw the famous Parthenon. The Theatre of Dionysus from the top. The view as I walked down from the Parthenon. This is where I did some souvenir shopping. There are tour buses that wait by Syntagma Square if you choose not to walk or take the metro. The guard standing in front of the Tomb of the Unknown Soldier and Parliament building. Shops filled with clothing, jewelry, and accessories. I thought the scenery inside the flea market was beautiful because of the trees. The restaurants line up one after another so there are many to choose from. Tried a delicious pork kebab. Stopped by Doctor Fish to experience the fish spa. It was extremely ticklish but you get used to it! They don't have any teeth so don't worry! Hadrian's Arch can be seen just on the local street of Athens. The entrance to the flea market. Inside the metro at Monastiraki. View of the Temple of Olympian Zeus from outside the gates. This last photo was at the Panathenian Stadium. I want to visit Athens someday!